Thyroid hormone importantly affects the cardiovascular system. However, evaluation of stroke volume (SV) and its determinants is confounded by variations in volume status that occur along different thyroid states. This study applied the pressure-volume (PV) framework to obtain relatively load-independent estimates of cardiac function in hypothyroidism as compared to euthyroidism. Ten athyroid patients were assessed echocardiographically after 4 weeks in deep hypothyroid state, and again after supplementation with oral Levothyroxine (LT4) for 3 months. 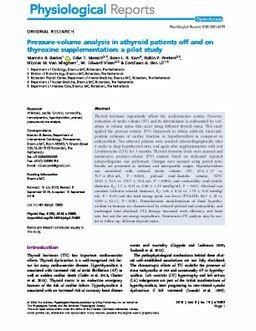 Thyroid hormone levels were assessed and noninvasive pressure-volume (PV) analysis based on dedicated repeated echocardiograms was performed. Changes were assessed using paired tests. Results are presented as medians and interquartile ranges. Hypothyroidism was associated with reduced stroke volume (SV: 67.6 ± 17 vs. 75.7 ± 20.6 mL, P = 0.024), preload (end-diastolic volume, EDV: 122.6 ± 32.5 vs. 135.7 ± 33.6 mL, P = 0.004), and contractility (end-systolic elastance, Ees : 1.7 ± 0.33 vs. 2.58 ± 1.33 mmHg/mL, P = 0.01). Afterload was constant (effective arterial elastance, Ea : 1.66 ± 0.32 vs. 1.79 ± 0.52 mmHg/mL, P = 0.43) and the total energy spent was lower (PVA∙HR: 86.7 ± 28 vs. 110.9 ± 32.1 J, P = 0.04). Hemodynamic manifestations of frank hypothyroidism in humans are characterized by reduced preload and contractility, and unchanged total afterload. LT4 therapy increased work efficiency and heart rate, but not the net energy expenditure. Noninvasive PV analysis may be useful to follow-up different thyroid states.